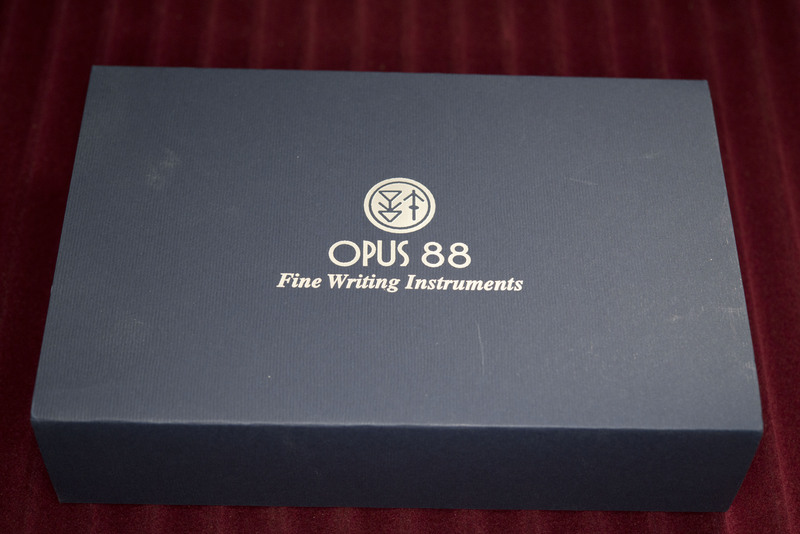 I’d been contemplating buying an OPUS 88 for a while. It was to be a Demonstrator, or once they were first shown, a colour demonstrator. In late January/early February this year the OMAR model was previewed and something about it grabbed me and my target purchase changed. Roll round March and the Spring Pen Show in London, I took the opportunity to buy one from Write Here. 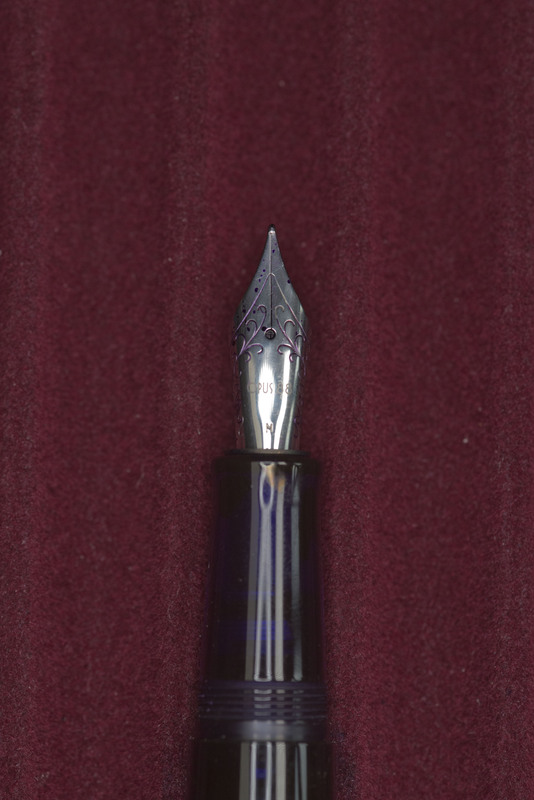 To me it is a good looking pen, though I know others find the ivory white finial and valve knob out of place. Perhaps they could have followed with other designs of theirs, such as the Fantasia, and matched the colour to the barrel or primary colour of the cap. 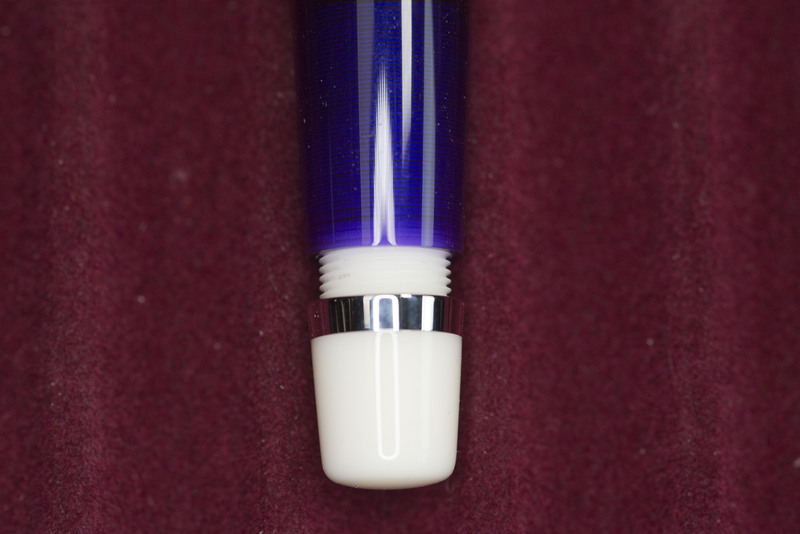 The purple acrylic is dark, but where the light shines through at the feed and the screw for the valve knob, there is a UV like glow. For no reason I can quite work out, the rest of the barrel is darker, perhaps the material is thicker. The downside is that to see the ink level you really need to hold the pen up to the light (dull day light does work). It is a sizeable pen. 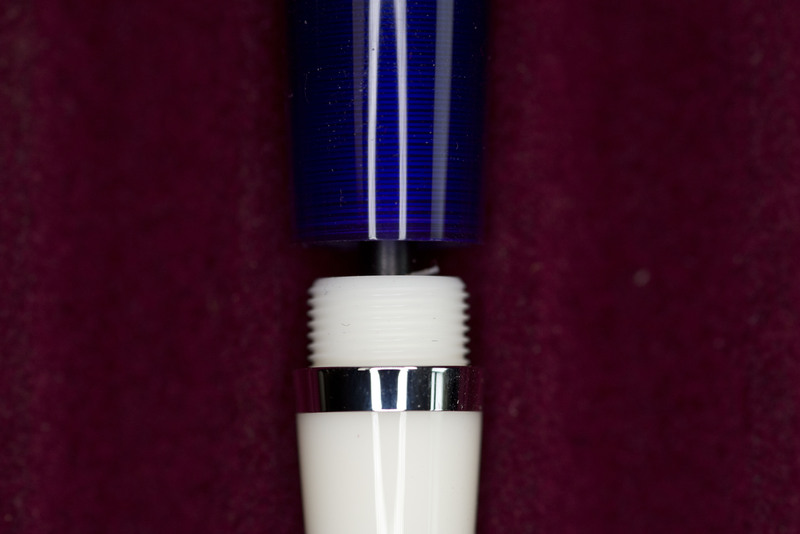 Similar in length and width to the Demonstrator, though the barrel curves in and out. 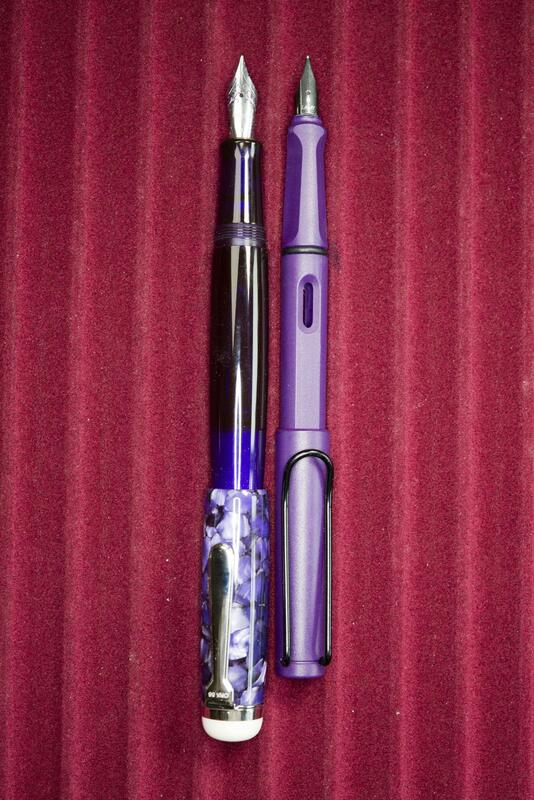 I’d suggest the grip section is from the same moulding and the nib is also a JoWo size 6. On this pen, as the grip curves out away from the nib, it’s line flows in parallel with the curve of the barrel, a nice look which is partly ruined by the straighter nature of valve knob. This is only a minor irritation, though possibly more obvious due to the different colour. The cap has a slight curve, but different in shape and position of widest point to the grip/barrel. However being of a different material and appearance, being a cracked ice style acrylic, this does work. In the hand it is a sizeable pen, and some will find it too large, but I find it comfortable to hold (or should that be wield) and the curving works well where it rests in the crook of my hand. The nib section, as previously mentioned, looks the same as on the Demonstrator models, which is no problem as it is comfortable with a slight curve up just before the nib to help keep your fingers in position. The threads are noticeable if you rub a finger over them but are actually kept away from the fingers by barrel being wider then the grip, with the curve helping guide fingers over the threads. It would be interesting to hear from left handers as the step is slightly sharp but again kept out of the way. I suspect a hold over type of grip may result in this pen being uncomfortable to use. The acrylic is shiny, but not slippery. 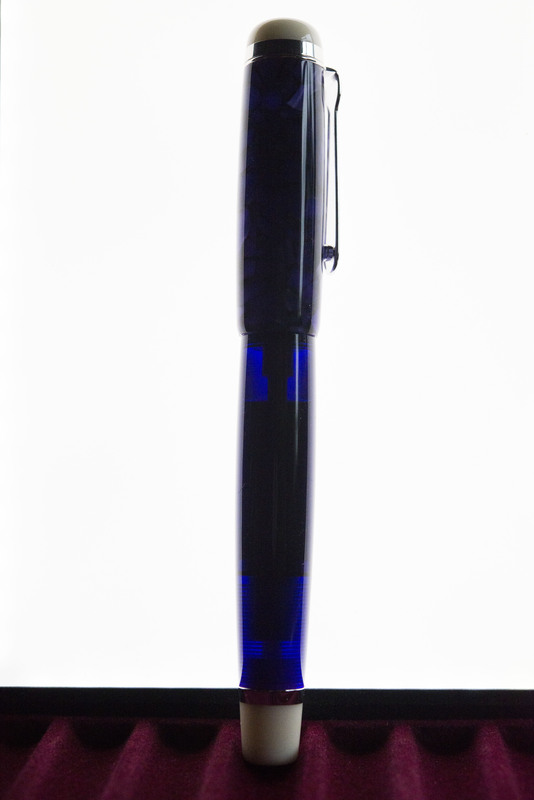 The balance point is towards the front, and the pen is surprisingly heavy, which may be due to the quantity of ink it holds. 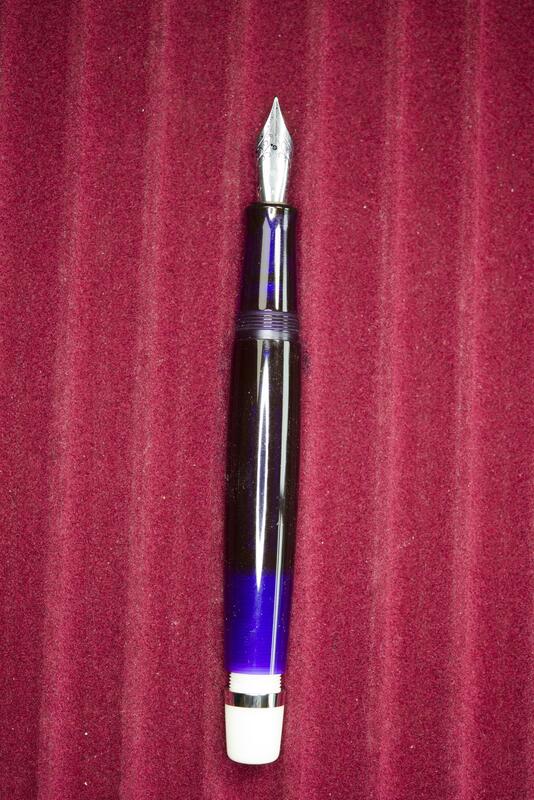 I should note this is not copper/brass pen heavy, but it is more than you would expect for an acrylic pen. 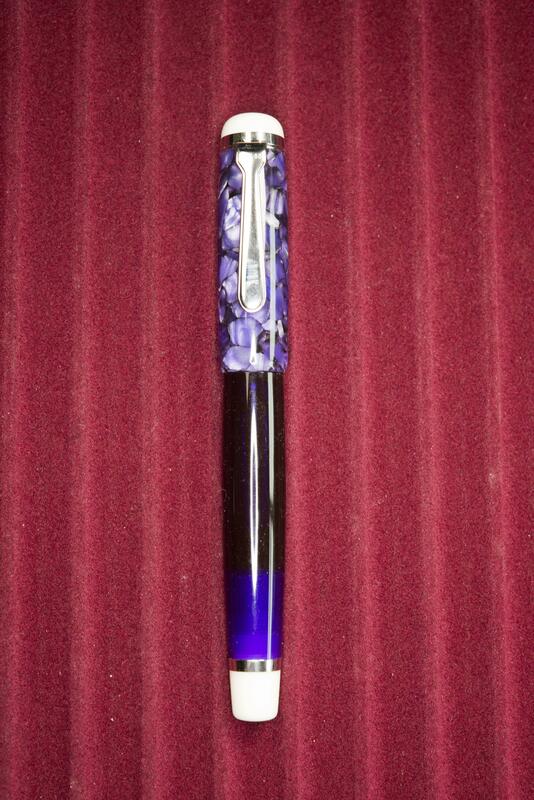 The cap can also post this pen. It looks odd, makes the pen over long, and throws the balance out, but despite the shallow connection it does fit securely. Th clip looks a bit like a knotted tie, especially with the collar round the bottom of the finial. It is flat, with a couple of millimetres between it and the the barrel, and a half ball on the underside just before the end to allow it to be securely slipped in to a pocket. It is stiff, boring, but works well. Personally I think the clip on the Picnic, Koloro, and Demonstrator would have looked better. There is matching metal collar between the barrel and the valve knob. 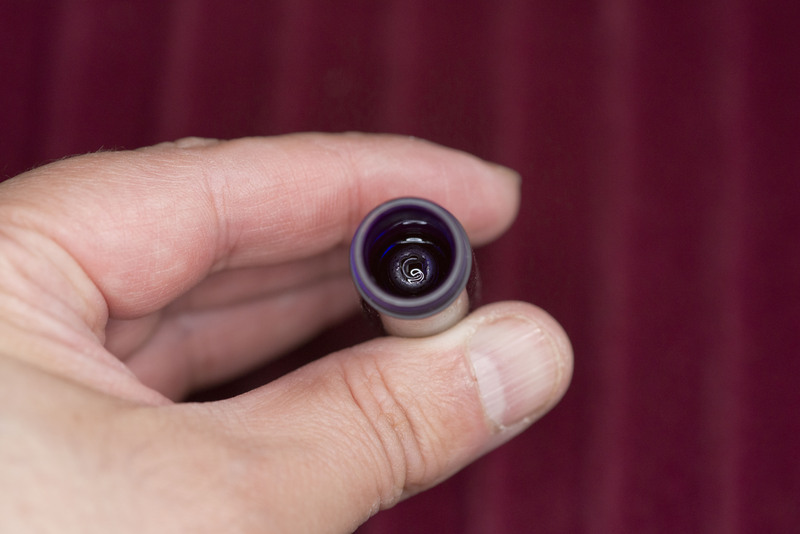 One of the big selling points of the pen is the fact it is an eye dropper with a shut off valve, allowing a large capacity of ink to be carried securely, and with reduced risk of burping. Certainly the feed holds a reasonable amount of ink and I comfortably wrote a side of A5 before creating this review without any signs of the nib running dry despite the valve being closed. 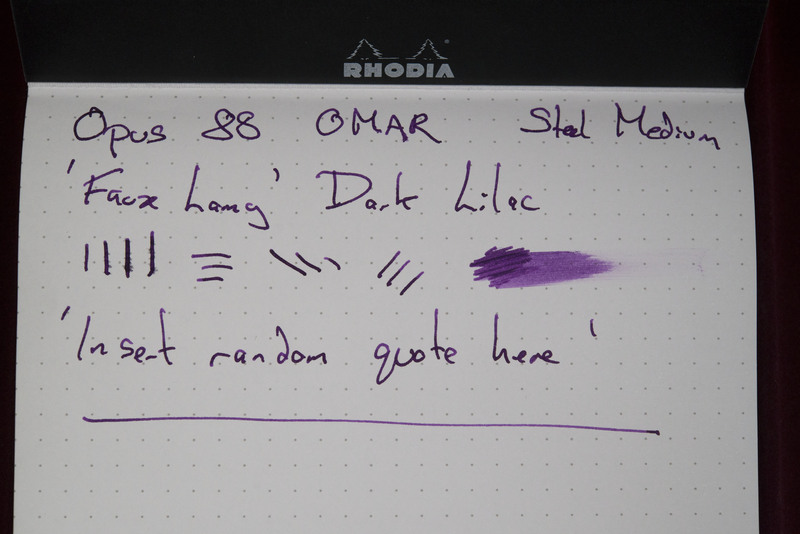 One thing I did note, and I’m not alone with this, is that opening the valve on OPUS 88 pens does increase the flow, but not by much and is not affected by how far open the valve is. 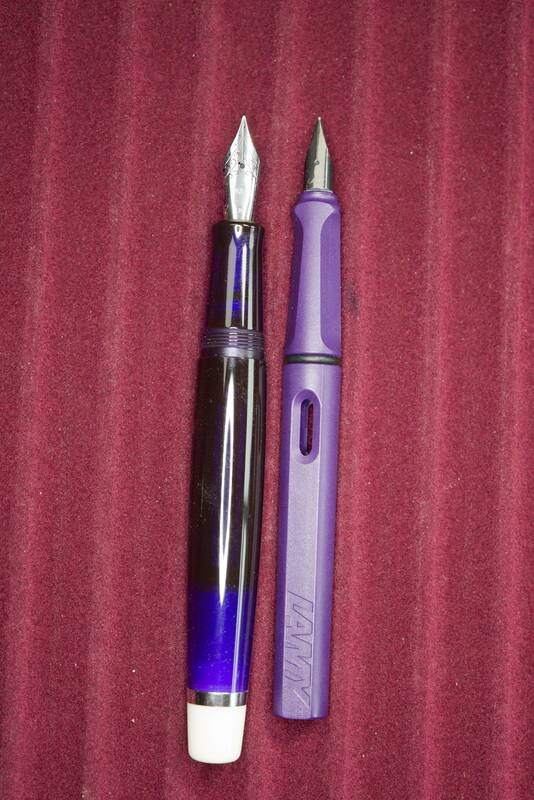 The pen, mine has a medium nib, is nicely wet. Not a gusher, but not remotely dry either, which is good as an early OPUS 88 Koloro I tried was very dry, again regardless of the valve position. 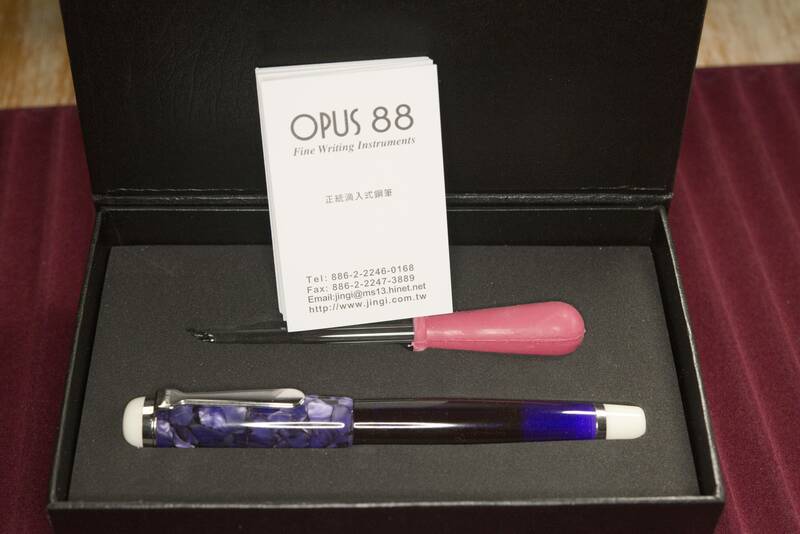 The nib itself is a JoWo #6 with OPUS 88 laser engraved in to it. The valve knob is initially stiff (this may loosen over time), but does turn smoothly. 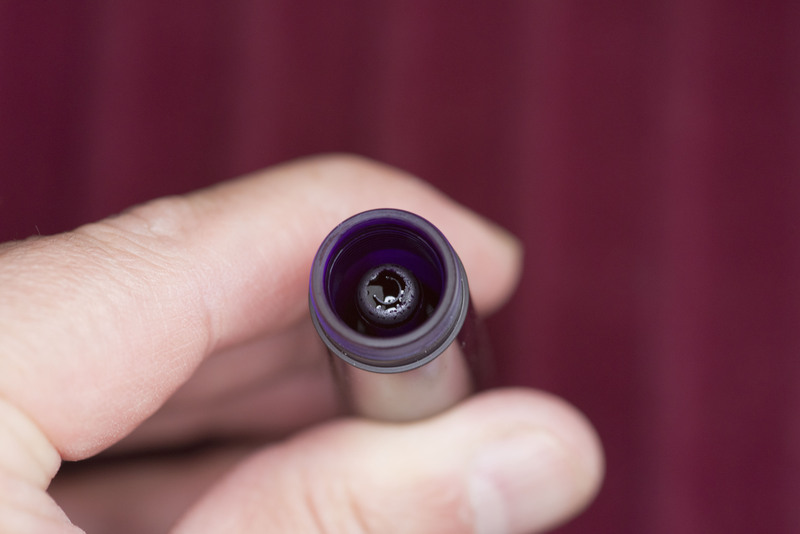 When fully opened, it requires a little force to pull the valve tap further up, something you’re unlikely to need to do unless cleaning the pen. In the pictures below you can see the valve when it is in the open and closed positions. The grip meets the barrel at the top of the threads, though you’ll be hard put to find the seem. There is a rubber ring at the top of the threads though I’ve seen no sign of ink ingress as the section is tough to unscrew at first. I suspect over repeated refills this will wear slightly and ring will prove it’s worth. Since I started writing the above I have noticed/discovered one thing. The material the cap is made from appears to be soft and prone to scratching. While you can not feel the scuffs below, in bright light they do become rather visible. I’m not sure how I managed to get them as the pen has either been in a soft lined case else resting on paper/book, and none of my other pens I’ve been using recently have suffered the same, nor has the barrel. 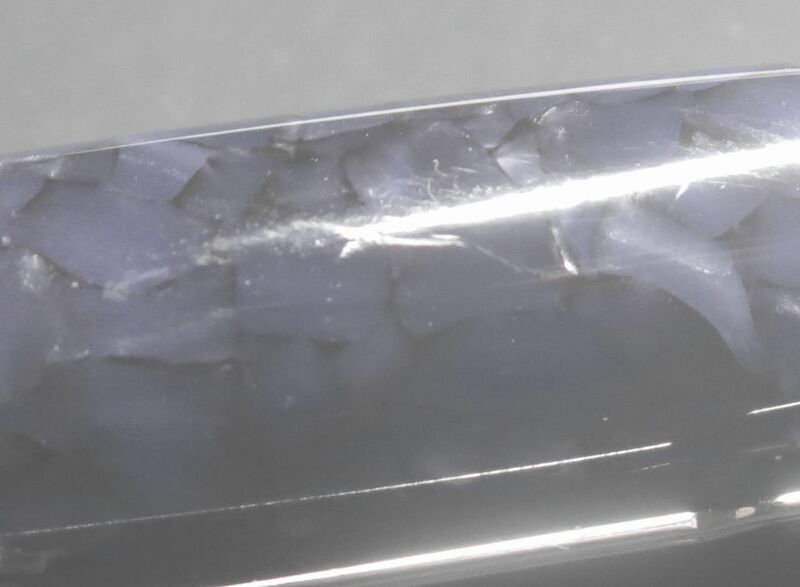 At first I was not sure as they do partly seem to follow the edge of a piece of acrylic, but if you look else where you’ll see the ‘binding agent’ is dark in colour. Am I glad I bought the pen. Yes. 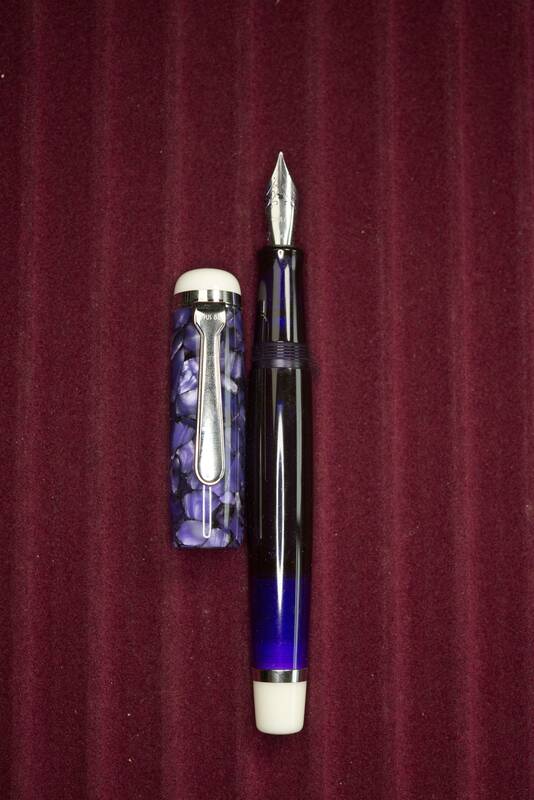 It is comfortable to hold, writes well, looks interesting, and while about 20% more than the Demonstrator models, at this price point (£110) it is reasonable value, with the material and looks justifying the additional cost. Others may disagree for the same reasons, especially when you consider the price of pens from the other Taiwanese maker, TWSBI. Is it perfect? Well I would have preferred the finial and valve knob to be purple, and the clip to be the same as on most the other models, but those are minor criticisms. Additionally the cap appears to be a scratch/scuff magnate, but at present that does not bother me, it’s just a bit annoying. The white finial and knob cap. Threads and step may prove to be uncomfortable to left handers. Cap appears to be prone to scratches. An afterword. 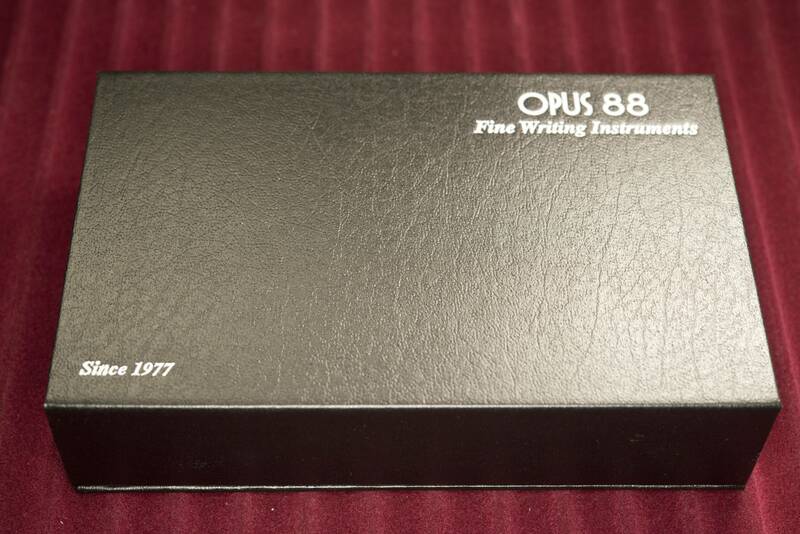 There is one thing that concerns me about OPUS 88. While I know they do (or have) made pens for others, their line up is becoming as cluttered as Lamy. There are now five models covering just two market segments, maybe three if you consider the Fantasia to be a pocket pen. As a new company it feels like they are rushing to get new models out there and this could affect the demand for the existing ones. 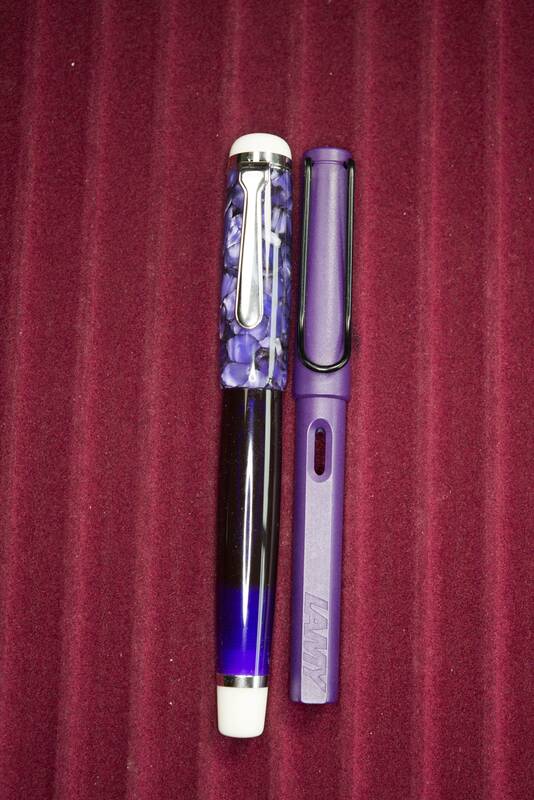 Vendors with unsold stock are unlikely to buy more pens or other models. I do hope this drive to grow the range does not prove to be their demise.